I returned to the house on Thursday, less than a week later. While there was plenty to attend to, the primary point of this visit was to complete the interaction with the house begun the week before. I was not looking forward to it. Delivering unpleasant news is never enjoyable. That evening, I found a candle, placed it on a table in the living room, and brought in my drum, rattles, and the medicine bag that I always carry in my truck. I sat for a while, gathering my thoughts and focusing on my intention to open an ongoing dialog with House. When I was ready, I rattled the perimeter of the room, all of the windows, and the furniture. Then, I offered an invitation to House and all other inhabitants to join me. I had unpleasant news to share. I stood in the middle of the room and waited silently. House did not take very long to join me. When it felt present—and perhaps some other ghosts, as well—I spoke my full name aloud and announced myself as the son of Curtis and Jo Starnes by their full names. I spoke my grandparents’ names as well, in order to establish my place in their lineages. Then, I revealed the sad news aloud. My parents would not be returning. They have a new, safe home to live in now, though it was not by their choice. I felt my heart cringe to hear the words out loud. I sat and began to play my drum. I reminded House about the last evening they had slept in their room. I reminded it that it had witnessed my father falling in the garage and against the wall earlier that evening. Then, later in the night, House had witnessed him falling and being unable to get up from the floor. I showed the images of flashing lights, and the ambulance as it arrived. I had not seen this, but I did my best to tap into the memory of House. I replayed my own very clear visual memories of first seeing him in the hospital. I remembered the scramble for their next home when the decision was made to discharge him to skilled nursing days later. He would not be able to return home for recovery. I then remembered them both in the skilled nursing facility, the quarantine from a virus that my mom carried unsuspected. It was a difficult time for them; they rarely left their hospital-like room for four weeks, since another infection broke out in their wing. In 21 days, the Medicare payments ran out and dad was to be discharged from skilled nursing at the end of the week. We had 3 days to find new accommodations and 10 days to move them. We were lucky. A small two-bedroom apartment in a well-respected elder care home was available. They moved in on the 15th of February. I said to House that they would not be returning. As I continued to drum, I told House that I would be coming there fairly often to begin to clear things up that were left undone. I needed a safe place to rest while doing so, and that I needed to clear out the office that I knew had become its heart. I expressed that I understood, but it was my parents’ desire that I do it rather than a stranger they might hire. After a while, I played the call-back and returned to ordinary reality. I blew out the candle, put away my tools, and went to sit outside for a brief while. All was done the best I could do it. The next day, I would build the altar. It was a rough night. I did not sleep well at all. I could not tell whether it was allergies or a cold, but I hardly slept. When I would fall asleep, I would awaken unable to breathe through my nose at all, even when trying to sleep sitting upright. Sometime during the early morning, I wondered whether the house was angry and trying to drive me out. I certainly felt like leaving but didn’t have the energy. However, later, I wondered whether I had actually tapped into House’s shock and grief over the news. I surrendered trying to sleep as gray dawn crept into the room. 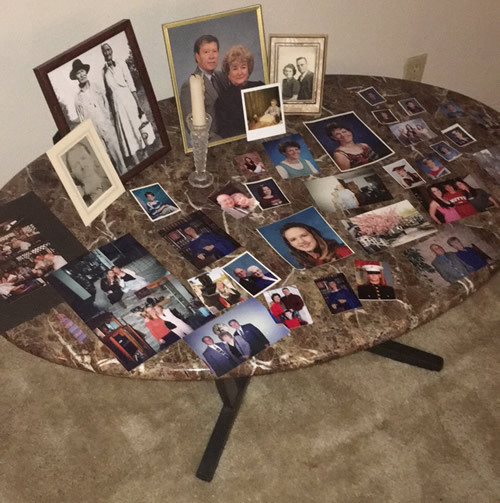 I had some coffee, a boiled egg, and dry toast, then made my way to the living room to rearrange the furniture for the altar. Once I removed the photos from dad’s desk, I arranged them similarly to how he had put them on the face of the doors of the armoire desk. Although the furniture arrangement did not feel right, I was done with the altar for the day. Then, I turned my attention to the office itself. All day, I held a running dialog with House, sometimes aloud and other times with my inner voice and ears. I asked for its help to make some decisions about what to keep and what to discard when it seemed right. After all, at this time, House might know my father better than I. By the end of the morning, we had cleared several bags of trash and made many trips to the recycling bin. I did go visit later in the afternoon, though I missed the facility’s executive director that I wanted to have a chat with. I was exhausted and it showed. I left after just a short while to run errands and go to the house, ate some soup, and called it a day. I awoke the following morning, Saturday, clear-headed. The allergy medications recommended by my sister to manage symptoms seemed to have worked. I woke early, determined to get back to work. I again rearranged the furniture into a new configuration that I thought of when I woke up. The new arrangement was perfect; I thanked House for the inspiration. The altar was placed against an empty wall in the living room at the end of the hall to the office, and could clearly be seen from there. In the office, I uncovered years of letters, cards, and memorabilia that House and I determined my father would have thought to be “of no current value.” My energy was waning, though, as I was still struggling against the effects of the allergies or cold. By late afternoon, it was clear that I would not return to the apartment that day. I called my dad at 4:00 pm to let him know. He was asleep and thought it was 4:00 am. It was an understandable mistake. The sky was darkened by the heavy clouds of an impending storm. I reminded him that supper was at 5:00 and that he and mom needed to hurry to get ready. That night I found a way to plug my laptop into the oversized monitor in the living room. House and its ghosts and I watched a World War II documentary (dad is a veteran) and another more contemporary movie from my saved movies list. It was a great break. I awoke on Sunday to the sounds of distant thunder and rain. I finally felt more myself again. House felt much more peaceful, as well. 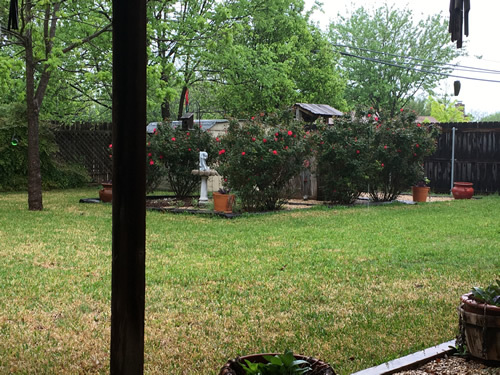 I made it a leisurely morning and even sat for a while on the covered back patio to watch the gentle rainfall. I packed up in the early afternoon and went to the apartment. I found the executive director in her office, so we got a chance to chat. I picked up some papers for the VA application and headed to the apartment where I found my parents in their wheelchairs, putting away laundry, so I helped. That done, I settled into the small couch for a chat. My sister joined us after a while and the four of us had a fairly rare opportunity to visit with little of importance to discuss and decide. And then, my father brought up that he thought that with a little more physical therapy and practice they could go back home. The topic always comes up, and it always hurts my heart. That, my sister and I and everyone else knows, is impossible. I realized on the drive home that the steadfast, almost possessive bond between House and my parents had clearly shifted. Not only did I feel more welcome, but the loving longtime relationship that bound House to them had been significantly altered. I could almost see both House and my father release their grips. House understood in a way that I don’t believe he ever will. There is much more to the relationships we have to our homes than is obvious or recognized in our culture. Much more. This entry was posted in End of Life, General, Learnings. Bookmark the permalink.